This article is about the dimension of a space. For the dimension of an object, see size. For the dimension of a quantity, see Dimensional analysis. For other uses, see Dimension (disambiguation). From left to right: the square, the cube and the tesseract. The two-dimensional (2d) square is bounded by one-dimensional (1d) lines; the three-dimensional (3d) cube by two-dimensional areas; and the four-dimensional (4d) tesseract by three-dimensional volumes. For display on a two-dimensional surface such as a screen, the 3d cube and 4d tesseract require projection. The first four spatial dimensions, represented in a two-dimensional picture. Two points can be connected to create a line segment. Two parallel line segments can be connected to form a square. Two parallel squares can be connected to form a cube. Two parallel cubes can be connected to form a tesseract. In physics and mathematics, the dimension of a mathematical space (or object) is informally defined as the minimum number of coordinates needed to specify any point within it. 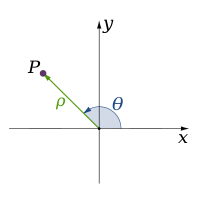 Thus a line has a dimension of one because only one coordinate is needed to specify a point on it – for example, the point at 5 on a number line. A surface such as a plane or the surface of a cylinder or sphere has a dimension of two because two coordinates are needed to specify a point on it – for example, both a latitude and longitude are required to locate a point on the surface of a sphere. The inside of a cube, a cylinder or a sphere is three-dimensional because three coordinates are needed to locate a point within these spaces. In classical mechanics, space and time are different categories and refer to absolute space and time. That conception of the world is a four-dimensional space but not the one that was found necessary to describe electromagnetism. The four dimensions of spacetime consist of events that are not absolutely defined spatially and temporally, but rather are known relative to the motion of an observer. Minkowski space first approximates the universe without gravity; the pseudo-Riemannian manifolds of general relativity describe spacetime with matter and gravity. Ten dimensions are used to describe superstring theory, eleven dimensions can describe supergravity and M-theory, and the state-space of quantum mechanics is an infinite-dimensional function space. The concept of dimension is not restricted to physical objects. High-dimensional spaces frequently occur in mathematics and the sciences. They may be parameter spaces or configuration spaces such as in Lagrangian or Hamiltonian mechanics; these are abstract spaces, independent of the physical space we live in. In mathematics, the dimension of an object is, roughly speaking, the number of degrees of freedom of a point that moves on this object. 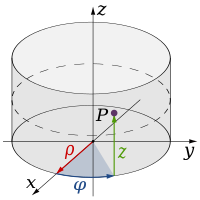 In other words, the dimension is the number of independent parameters or coordinates that are needed for defining the position of a point that is constrained to be on the object. For example, the dimension of a point is zero; the dimension of a line is one, as a point can move on a line in only one direction (or its opposite); the dimension of a plane is two, etc. The dimension is an intrinsic property of an object, in the sense that it is independent of the dimension of the space in which the object is or can be embedded. For example, a curve, such as a circle is of dimension one, because the position of a point on a curve is determined by its signed distance along the curve to a fixed point on the curve. This is independent from the fact that a curve cannot be embedded in a Euclidean space of dimension lower than two, unless it is a line. The dimension of Euclidean n-space En is n. When trying to generalize to other types of spaces, one is faced with the question "what makes En n-dimensional?" One answer is that to cover a fixed ball in En by small balls of radius ε, one needs on the order of ε−n such small balls. This observation leads to the definition of the Minkowski dimension and its more sophisticated variant, the Hausdorff dimension, but there are also other answers to that question. For example, the boundary of a ball in En looks locally like En-1 and this leads to the notion of the inductive dimension. While these notions agree on En, they turn out to be different when one looks at more general spaces. A tesseract is an example of a four-dimensional object. Whereas outside mathematics the use of the term "dimension" is as in: "A tesseract has four dimensions", mathematicians usually express this as: "The tesseract has dimension 4", or: "The dimension of the tesseract is 4". Although the notion of higher dimensions goes back to René Descartes, substantial development of a higher-dimensional geometry only began in the 19th century, via the work of Arthur Cayley, William Rowan Hamilton, Ludwig Schläfli and Bernhard Riemann. Riemann's 1854 Habilitationsschrift, Schläfli's 1852 Theorie der vielfachen Kontinuität, and Hamilton's discovery of the quaternions and John T. Graves' discovery of the octonions in 1843 marked the beginning of higher-dimensional geometry. The rest of this section examines some of the more important mathematical definitions of dimension. The dimension of a vector space is the number of vectors in any basis for the space, i.e. 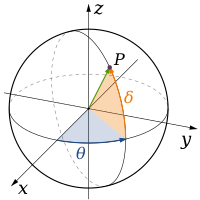 the number of coordinates necessary to specify any vector. This notion of dimension (the cardinality of a basis) is often referred to as the Hamel dimension or algebraic dimension to distinguish it from other notions of dimension. For the non-free case, this generalizes to the notion of the length of a module. The uniquely defined dimension of every connected topological manifold can be calculated. A connected topological manifold is locally homeomorphic to Euclidean n-space, in which the number n is the manifold's dimension. For connected differentiable manifolds, the dimension is also the dimension of the tangent vector space at any point. In geometric topology, the theory of manifolds is characterized by the way dimensions 1 and 2 are relatively elementary, the high-dimensional cases n > 4 are simplified by having extra space in which to "work"; and the cases n = 3 and 4 are in some senses the most difficult. 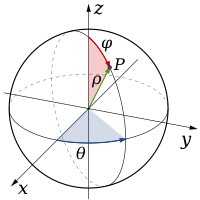 This state of affairs was highly marked in the various cases of the Poincaré conjecture, where four different proof methods are applied. The dimension of a manifold depends on the base field with respect to which Euclidean space is defined. While analysis usually assumes a manifold to be over the real numbers, it is sometimes useful in the study of complex manifolds and algebraic varieties to work over the complex numbers instead. A complex number (x + iy) has a real part x and an imaginary part y, where x and y are both real numbers; hence, the complex dimension is half the real dimension. Conversely, in algebraically unconstrained contexts, a single complex coordinate system may be applied to an object having two real dimensions. For example, an ordinary two-dimensional spherical surface, when given a complex metric, becomes a Riemann sphere of one complex dimension. The dimension of an algebraic variety may be defined in various equivalent ways. The most intuitive way is probably the dimension of the tangent space at any Regular point of an algebraic variety. Another intuitive way is to define the dimension as the number of hyperplanes that are needed in order to have an intersection with the variety that is reduced to a finite number of points (dimension zero). 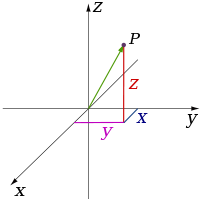 This definition is based on the fact that the intersection of a variety with a hyperplane reduces the dimension by one unless if the hyperplane contains the variety. Each variety can be considered as an algebraic stack, and its dimension as variety agrees with its dimension as stack. There are however many stacks which do not correspond to varieties, and some of these have negative dimension. Specifically, if V is a variety of dimension m and G is an algebraic group of dimension n acting on V, then the quotient stack [V/G] has dimension m−n. of prime ideals related by inclusion. It is strongly related to the dimension of an algebraic variety, because of the natural correspondence between sub-varieties and prime ideals of the ring of the polynomials on the variety. For an algebra over a field, the dimension as vector space is finite if and only if its Krull dimension is 0. For any normal topological space X, the Lebesgue covering dimension of X is defined to be n if n is the smallest integer for which the following holds: any open cover has an open refinement (a second open cover where each element is a subset of an element in the first cover) such that no point is included in more than n + 1 elements. In this case dim X = n. For X a manifold, this coincides with the dimension mentioned above. If no such integer n exists, then the dimension of X is said to be infinite, and one writes dim X = ∞. 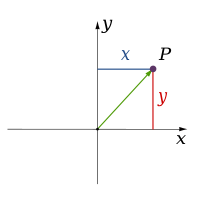 Moreover, X has dimension −1, i.e. dim X = −1 if and only if X is empty. This definition of covering dimension can be extended from the class of normal spaces to all Tychonoff spaces merely by replacing the term "open" in the definition by the term "functionally open". An inductive dimension may be defined inductively as follows. Consider a discrete set of points (such as a finite collection of points) to be 0-dimensional. 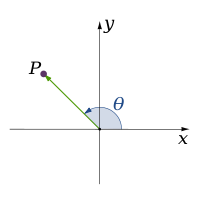 By dragging a 0-dimensional object in some direction, one obtains a 1-dimensional object. By dragging a 1-dimensional object in a new direction, one obtains a 2-dimensional object. In general one obtains an (n + 1)-dimensional object by dragging an n-dimensional object in a new direction. The inductive dimension of a topological space may refer to the small inductive dimension or the large inductive dimension, and is based on the analogy that (n + 1)-dimensional balls have n-dimensional boundaries, permitting an inductive definition based on the dimension of the boundaries of open sets. Similarly, for the class of CW complexes, the dimension of an object is the largest n for which the n-skeleton is nontrivial. Intuitively, this can be described as follows: if the original space can be continuously deformed into a collection of higher-dimensional triangles joined at their faces with a complicated surface, then the dimension of the object is the dimension of those triangles. See also: dimension of a scheme. Every Hilbert space admits an orthonormal basis, and any two such bases for a particular space have the same cardinality. This cardinality is called the dimension of the Hilbert space. This dimension is finite if and only if the space's Hamel dimension is finite, and in this case the two dimensions coincide. A temporal dimension is a dimension of time. Time is often referred to as the "fourth dimension" for this reason, but that is not to imply that it is a spatial dimension. A temporal dimension is one way to measure physical change. It is perceived differently from the three spatial dimensions in that there is only one of it, and that we cannot move freely in time but subjectively move in one direction. The equations used in physics to model reality do not treat time in the same way that humans commonly perceive it. The equations of classical mechanics are symmetric with respect to time, and equations of quantum mechanics are typically symmetric if both time and other quantities (such as charge and parity) are reversed. In these models, the perception of time flowing in one direction is an artifact of the laws of thermodynamics (we perceive time as flowing in the direction of increasing entropy). The best-known treatment of time as a dimension is Poincaré and Einstein's special relativity (and extended to general relativity), which treats perceived space and time as components of a four-dimensional manifold, known as spacetime, and in the special, flat case as Minkowski space. In physics, three dimensions of space and one of time is the accepted norm. However, there are theories that attempt to unify the four fundamental forces by introducing extra dimensions. Most notably, superstring theory requires 10 spacetime dimensions, and originates from a more fundamental 11-dimensional theory tentatively called M-theory which subsumes five previously distinct superstring theories. To date, no experimental or observational evidence is available to support the existence of these extra dimensions. If extra dimensions exist, they must be hidden from us by some physical mechanism. One well-studied possibility is that the extra dimensions may be "curled up" at such tiny scales as to be effectively invisible to current experiments. Limits on the size and other properties of extra dimensions are set by particle experiments[clarification needed] such as those at the Large Hadron Collider. At the level of quantum field theory, Kaluza–Klein theory unifies gravity with gauge interactions, based on the realization that gravity propagating in small, compact extra dimensions is equivalent to gauge interactions at long distances. In particular when the geometry of the extra dimensions is trivial, it reproduces electromagnetism. However at sufficiently high energies or short distances, this setup still suffers from the same pathologies that famously obstruct direct attempts to describe quantum gravity. Therefore, these models still require a UV completion, of the kind that string theory is intended to provide. In particular, superstring theory requires six compact dimensions forming a Calabi–Yau manifold. Thus Kaluza-Klein theory may be considered either as an incomplete description on its own, or as a subset of string theory model building. In addition to small and curled up extra dimensions, there may be extra dimensions that instead aren't apparent because the matter associated with our visible universe is localized on a (3 + 1)-dimensional subspace. Thus the extra dimensions need not be small and compact but may be large extra dimensions. D-branes are dynamical extended objects of various dimensionalities predicted by string theory that could play this role. They have the property that open string excitations, which are associated with gauge interactions, are confined to the brane by their endpoints, whereas the closed strings that mediate the gravitational interaction are free to propagate into the whole spacetime, or "the bulk". This could be related to why gravity is exponentially weaker than the other forces, as it effectively dilutes itself as it propagates into a higher-dimensional volume. Some aspects of brane physics have been applied to cosmology. For example, brane gas cosmology attempts to explain why there are three dimensions of space using topological and thermodynamic considerations. According to this idea it would be because three is the largest number of spatial dimensions where strings can generically intersect. If initially there are lots of windings of strings around compact dimensions, space could only expand to macroscopic sizes once these windings are eliminated, which requires oppositely wound strings to find each other and annihilate. But strings can only find each other to annihilate at a meaningful rate in three dimensions, so it follows that only three dimensions of space are allowed to grow large given this kind of initial configuration. Extra dimensions are said to be universal if all fields are equally free to propagate within them. Some complex networks are characterized by fractal dimensions. The concept of dimension can be generalized to include networks embedded in space. The dimension characterize their spatial constraints. Science fiction texts often mention the concept of "dimension" when referring to parallel or alternate universes or other imagined planes of existence. This usage is derived from the idea that to travel to parallel/alternate universes/planes of existence one must travel in a direction/dimension besides the standard ones. In effect, the other universes/planes are just a small distance away from our own, but the distance is in a fourth (or higher) spatial (or non-spatial) dimension, not the standard ones. One of the most heralded science fiction stories regarding true geometric dimensionality, and often recommended as a starting point for those just starting to investigate such matters, is the 1884 novella Flatland by Edwin A. Abbott. Isaac Asimov, in his foreword to the Signet Classics 1984 edition, described Flatland as "The best introduction one can find into the manner of perceiving dimensions." The idea of other dimensions was incorporated into many early science fiction stories, appearing prominently, for example, in Miles J. Breuer's The Appendix and the Spectacles (1928) and Murray Leinster's The Fifth-Dimension Catapult (1931); and appeared irregularly in science fiction by the 1940s. Classic stories involving other dimensions include Robert A. Heinlein's —And He Built a Crooked House (1941), in which a California architect designs a house based on a three-dimensional projection of a tesseract; and Alan E. Nourse's Tiger by the Tail and The Universe Between (both 1951). Another reference is Madeleine L'Engle's novel A Wrinkle In Time (1962), which uses the fifth dimension as a way for "tesseracting the universe" or "folding" space in order to move across it quickly. The fourth and fifth dimensions are also a key component of the book The Boy Who Reversed Himself by William Sleator. Immanuel Kant, in 1783, wrote: "That everywhere space (which is not itself the boundary of another space) has three dimensions and that space in general cannot have more dimensions is based on the proposition that not more than three lines can intersect at right angles in one point. This proposition cannot at all be shown from concepts, but rests immediately on intuition and indeed on pure intuition a priori because it is apodictically (demonstrably) certain." "Space has Four Dimensions" is a short story published in 1846 by German philosopher and experimental psychologist Gustav Fechner under the pseudonym "Dr. Mises". The protagonist in the tale is a shadow who is aware of and able to communicate with other shadows, but who is trapped on a two-dimensional surface. According to Fechner, this "shadow-man" would conceive of the third dimension as being one of time. The story bears a strong similarity to the "Allegory of the Cave" presented in Plato's The Republic (c. 380 BC). Simon Newcomb wrote an article for the Bulletin of the American Mathematical Society in 1898 entitled "The Philosophy of Hyperspace". Linda Dalrymple Henderson coined the term "hyperspace philosophy", used to describe writing that uses higher dimensions to explore metaphysical themes, in her 1983 thesis about the fourth dimension in early-twentieth-century art. Examples of "hyperspace philosophers" include Charles Howard Hinton, the first writer, in 1888, to use the word "tesseract"; and the Russian esotericist P. D. Ouspensky. ^ "Curious About Astronomy". Curious.astro.cornell.edu. Archived from the original on 2014-01-11. Retrieved 2014-03-03. ^ "MathWorld: Dimension". Mathworld.wolfram.com. 2014-02-27. Archived from the original on 2014-03-25. Retrieved 2014-03-03. ^ Yau, S-T and Nadis, S.; The Shape of Inner Space, Basic Books, 2010, Chapter 4. ^ Bunde, Armin; Havlin, Shlomo, eds. (1991). Fractals and Disordered Systems. Springer. ^ Bunde, Armin; Havlin, Shlomo, eds. (1994). Fractals in Science. Springer. ^ Scott Watson, Brane Gas Cosmology Archived 2014-10-27 at the Wayback Machine (pdf). ^ Song, Chaoming; Havlin, Shlomo; Makse, Hernán A. (2005). "Self-similarity of complex networks". Nature. 433 (7024): 392–395. arXiv:cond-mat/0503078v1. Bibcode:2005Natur.433..392S. doi:10.1038/nature03248. PMID 15674285. ^ Daqing, Li; Kosmidis, Kosmas; Bunde, Armin; Havlin, Shlomo (2011). "Dimension of spatially embedded networks". Nature Physics. 7 (6): 481. Bibcode:2011NatPh...7..481D. doi:10.1038/nphys1932. ^ Banchoff, Thomas F. (1990). "From Flatland to Hypergraphics: Interacting with Higher Dimensions". Interdisciplinary Science Reviews. 15 (4): 364. doi:10.1179/030801890789797239. Archived from the original on 2013-04-14. ^ Newcomb, Simon (1898). "The Philosophy of Hyperspace". Bulletin of the American Mathematical Society. 4 (5): 187. Bibcode:1994BAMaS..30..205W. doi:10.1090/S0002-9904-1898-00478-0. ^ Kruger, Runette (2007). "Art in the Fourth Dimension: Giving Form to Form – The Abstract Paintings of Piet Mondrian" (PDF). Spaces of Utopia: An Electronic Journal (5): 11. Archived (PDF) from the original on 2011-09-29. ^ Pickover, Clifford A. (2009), "Tesseract", The Math Book: From Pythagoras to the 57th Dimension, 250 Milestones in the History of Mathematics, Sterling Publishing Company, Inc., p. 282, ISBN 978-1-4027-5796-9, archived from the original on 2017-03-30 . Katta G Murty, "Systems of Simultaneous Linear Equations" (Chapter 1 of Computational and Algorithmic Linear Algebra and n-Dimensional Geometry, World Scientific Publishing: 2014 (ISBN 978-981-4366-62-5). Edwin A. Abbott, Flatland: A Romance of Many Dimensions (1884) (Public domain: Online version with ASCII approximation of illustrations at Project Gutenberg). Thomas Banchoff, Beyond the Third Dimension: Geometry, Computer Graphics, and Higher Dimensions, Second Edition, W. H. Freeman and Company: 1996. Clifford A. Pickover, Surfing through Hyperspace: Understanding Higher Universes in Six Easy Lessons, Oxford University Press: 1999. Rudy Rucker, The Fourth Dimension, Houghton-Mifflin: 1984. Kaku, Michio (1994). Hyperspace, a Scientific Odyssey Through the 10th Dimension. Oxford University Press. ISBN 978-0-19-286189-4. Krauss, Lawrence M. (2005). Hiding in the Mirror. Viking Press. ISBN 978-0-670-03395-9. Wikimedia Commons has media related to Dimensions. Wikisource has the text of the 1911 Encyclopædia Britannica article Dimension. Copeland, Ed (2009). "Extra Dimensions". Sixty Symbols. Brady Haran for the University of Nottingham.